This sounds like a criticism, but I don’t mean it that way. I actually like watching those videos, as long as they feel real or I’m interested in the subject matter. In this show, despite lofty aphorisms (“I think Minnesota is one of the best kept secrets in the country”) the participants come across as earnest. And who doesn’t like hearing about their own community? Childish though it might have been, every time a shot of the McNamara Alumni Center flashed across the screen, I thought “ooo that’s where we are right now!” It’s hard not to take it at face value when the filmmaker is in your row and the tech luminaries on screen just walked off the stage after their introductions. The contributors warn us not to strive to be the “silicon prairie”– that we should embrace our own identity. We’re taught how our tech chops were formed in the secrecy of post WW2 military projects and that in the early computing days, IBM and most of the other big players were in Minnesota. Despite the irony, we’re told that our midwestern values prevent us from talking about how those same values also make us loyal and productive. Indeed, this humility underscores the need for the film– to tell the stories we’re too polite to tell. This ethos, they suggest, was probably formed from our agrarian roots and extreme climate. We’ve been forced to collaborate for generations, and that brings a competitive advantage in our new connected world. Ultimately it’s our people, everyone seems to agree, which make the technology community in Minnesota such a success. During Nick’s introduction, he encouraged us to participate, celebrate, and advocate. DocuMNtary lived up to those words– and more importantly it’s infectious. From the boisterous ovation and discussion afterward, it was clear the audience was charged with its energy. And as if on cue, the power of community was displayed right in front of us as Dustin Passofaro entered the conversation. He’s the CTO at Genovest which makes investment tools for individual value traders. Jonathan just happens to work for Interactive Data Corporation (purchased by Intercontinental Exchange, which owns the New York Stock Exchange), and it turns out they supply some financial data Genovest might want to buy. These random encounters showcase the value of in-person community events. So thank you to everyone who is participating, celebrating, and advocating. 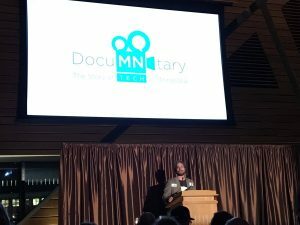 And thank you to the creators of DocuMNtary for reminding us of how important that is and how successful we are. This entry was posted in Tech Community on 2016/09/23 by Riley Major.